The causes of depression have been linked to abnormal function of nerve cells in specific parts of the brain. As a result, these regions of the brain are implicated in mood regulation. It is thought that TMS Therapy stimulates regions that are thought to be impaired by the patient’s condition. Targeting these specific regions of the brain reactivates the neurons in those areas by depolarizing them. For instance, numerous studies have shown that TMS produces changes in neural activity in regions of the brain implicated in mood regulation, such as the prefrontal cortex. This area is targeted in treating Major Depressive Disorder. It is also important to note that the pulses from the TMS coil do not affect the entire brain. Instead, the magnetic field is highly targeted and depending on the device will only affect the top 2-3 or 5-6 centimeters into the brain, directly beneath the TMS coil. The exact mechanics of TMS Therapy are still of an unknown origin, but the science behind TMS is constantly being explored and understood. Today, scientists can only observe the effects that electromagnetic stimulation from TMS has on the brain. However this is changing as more research goes into TMS technology. In treating major Depressive Disorder, it is believed that the electromagnetic currents from the TMS coil activate specific neurotransmitters — serotonin, norepinephrine and dopamine — which have been implicated in the symptoms of depression. Studies have shown that the front-left side of the brain is an area that can be under-active in individuals with major depression, hence the rationale for the site of the stimulation. Current research suggests that when small electrical currents are directed at the prefrontal cortex of the brain, there is an increase in blood flow and glucose metabolism, which may elevate mood. This has been documented in neuro-imaging studies which have directly observed changes in cortical metabolic activity in tissue directly stimulated by TMS Therapy. This may prove a basis for how TMS works in other treatments as well. TMS Therapy utilizes a TMS coil which is either applied to the scalp or waved over the prefrontal cortex by a trained TMS technician. This TMS coil is designed to deliver highly focused magnetic pulses to the left prefrontal cortex. The TMS coil stimulation in the part of the brain that regulates mood, is believed to trigger a cascade of neurochemical events, including the release of neurotransmitters (such as serotonin, norepinephrine, and dopamine) to help normalize neurotransmitter function. The highly concentrated electromagnetic fields created by the magnetic coil turn on and off very rapidly. These magnetic fields are similar to those produced by a magnetic resonance imaging (MRI) machine. Although they are small, these induced electric currents in the brain can cause the neurons to fire or become more active. It is this stimulation which is believed to trigger further changes in the brain circuits responsible for depression. 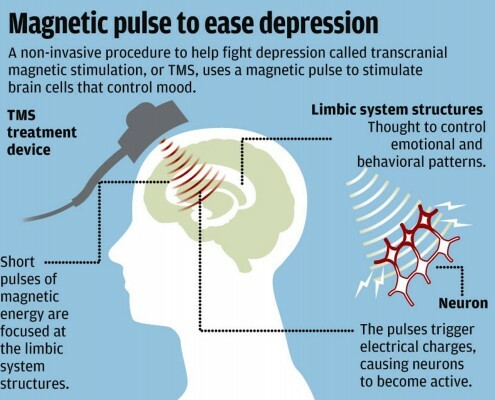 In other words, the magnetic pulses delivered from the TMS coil reinvigorate parts of the brain that might not be working properly in severely depressed patients.